We have revised the Open Standards Principles to make it easier for departments to adopt open standards. We iterated the existing Open Standards Principles as part of the Government Transformation Strategy and the UK Digital Strategy. The updated version of the principles uses clearer language and clarifies several important points. The Cabinet Office mandates the use of the Open Standards principles, which say that all documents and data we create need to be available in open formats. It is vitally important to ensure that the Civil Service adheres to these principles. Open standards underpin so much of the work we do in the Civil Service. We can help to reduce costs, prevent vendor lock-in and fulfil our commitments to the Open Government Partnership by promoting the adoption of open standards across government. We thank everyone who sent us comments and helped us improve this document. It was a pleasure working with so many people from across government, with external organisations, and with individuals. 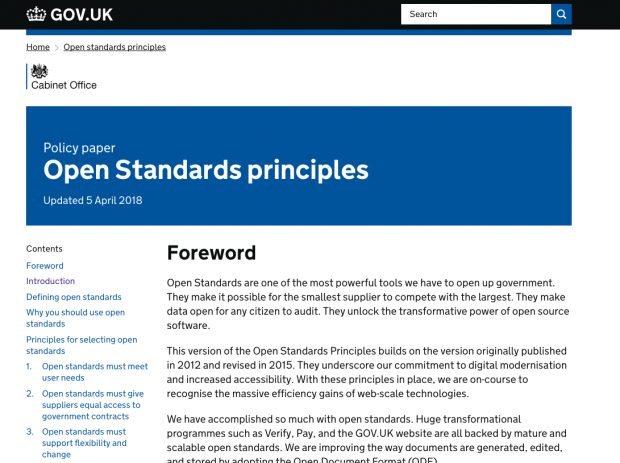 Read the Open Standards Principles and don't forget to subscribe to this blog to receive email updates when new posts are published.